Two immediate things about Jordan Peele’s highly anticipated “Get Out” follow-up, “Us”: 1) If you love thoughtful horror films and don’t know much about this one, stop reading and get to the theater right now; this is one of those movies that you should allow to surprise you. 2) Lupita Nyong’o’s performance is … wow. Oooookay. (Breathes; tries to remember movie without freaking self out; promises self a cleansing rom-com viewing later.) “Us” is, essentially, about otherness, exploring both the literal idea that each of us has a doppelgänger hiding in the shadows, gazing with envy and resentment at our lives, and the more general idea of others — people who are not like us, who we can blame for the problems of society. It’s about the terror that ensues when a regular American family finds itself face-to-face with those others — who are angry and violent, and, as a child in the movie says, “They’re us.” And yes, it’s scary as hell. 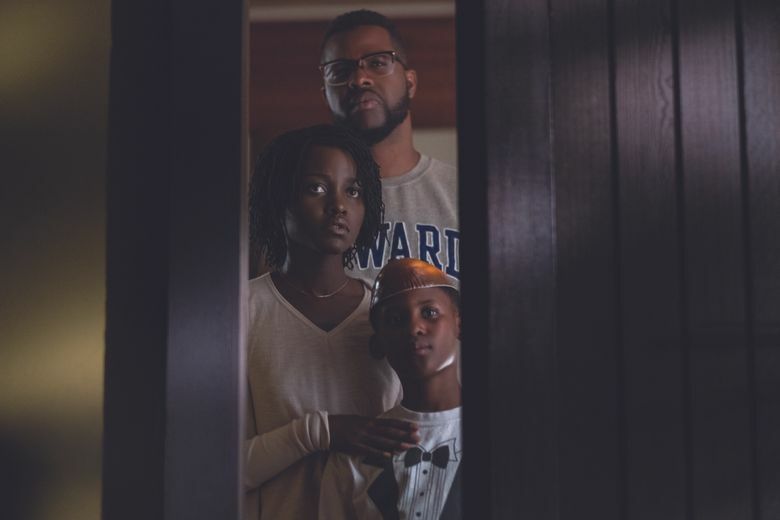 The story unfolds in the context of a perfectly ordinary weekend, in which the Wilsons — parents Adelaide (Nyong’o) and Gabe (Winston Duke), kids Zora (Shahadi Wright Joseph) and Jason (Evan Alex) — head to their lake house for some relaxation and sunshine. A prologue, set in 1986, shows us a mysterious event in Adelaide’s past: As a child, she was separated from her parents at a carnival and became lost in a dark funhouse hall of mirrors, finding there a little girl who looked just like her. Grown-up Adelaide is still haunted by this event — “I feel like she’s still coming for me,” she tells Gabe — and when four red-jumpsuit-clad figures turn up on the driveway late at night, she somehow knows it’s a reckoning. Everyone in the cast, all playing double roles, is superb: the talented child actors (Joseph, as Zora’s double, has a grin that could chill lava); Elisabeth Moss and Tim Heidecker as the Wilsons’ insufferable friends; Duke, channeling the charm he showed in “Black Panther,” as a cheerfully laid-back husband/dad who knows how to make his own fun. 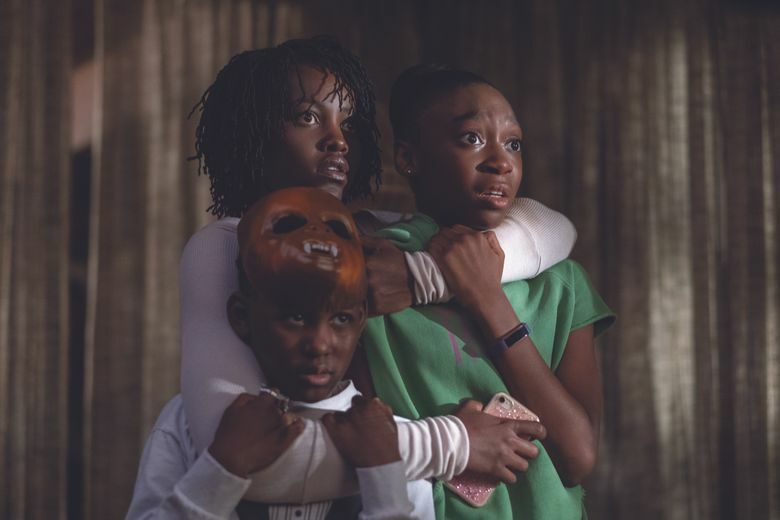 But the movie is owned by Nyong’o, who in Adelaide creates a woman who’s both fierce mother-warrior and frightened — literally — of her own shadow. As Red, her double, Nyong’o speaks in a voice that seems to have been silenced for decades; her tones are painful, scraping, primal. You’ll strain to hear; you won’t miss, or forget, a word. ★★★½ “Us,” with Lupita Nyong’o, Winston Duke, Elisabeth Moss, Tim Heidecker, Shahadi Wright Joseph, Evan Alex. Written and directed by Jordan Peele. 116 minutes. Rated R for violence/terror and language. Opens March 21 at multiple theaters.